The share of the adult population, 16 and over, participating in the labor force is at its lowest level since 1978, at 62.8% and 62.9% in June and July, respectively. 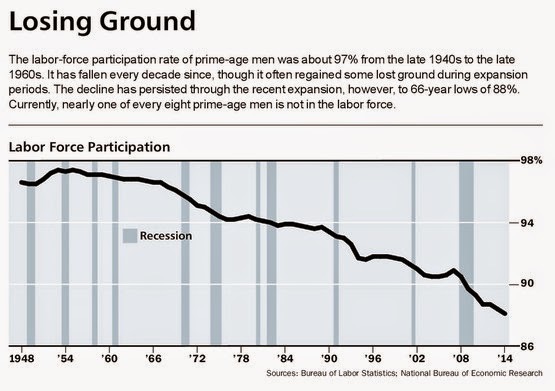 In a comprehensive study of trends in the workforce released in December, the Bureau of Labor Statistics said it expects a further decline in labor-force participation, to 61.6%, by 2022. Do some of these people [dropping out of the labor force] have independent means? If so, their number is small. Census Bureau data show that in 2012, just 232,000 prime-age men, or 0.4% of the total cohort, had income from stocks, bonds, and real estate of $50,000 or more, while 76,000 enjoyed an investment income of $100,000 or more. Both figures should be enough to get by without income from a job. But we don't know how many of these men supplemented that income with work. Ben & Jerry's preparing for shrinkage? We have long noted the tendency of packaged goods sellers to shrink packages in order to hide inflation. Our friend Negocios Loucos points us to another possible instance. 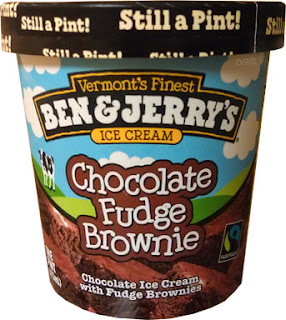 When Haagen-Dazs shrunk their "pints" to 14 ounces a few years ago thanks to food cost inflation, Ben & Jerry's responded by labeling their ice cream "Still a Pint!" Doctor refuses to submit to Obamacare, instead provides quality, affordable free-market care. An alliance of Islamist militias said it wrested control of Tripoli’s international airport from a rival force after weeks of fighting that triggered an exodus of foreigners and threatened to plunge Libya deeper into chaos. Libya’s defunct, Islamist-dominated parliament said it would temporarily resume its sessions, the state-run Libya News Agency reported, a move that may set the stage for dueling legislatures amid a leadership vacuum. The fighting has battered Libya, undercut efforts to revive oil output in the OPEC member and dimmed hopes for a transition to democracy. It has sparked concern the nation, led by a largely toothless central government, will descend into anarchy and emerge as little more than a failed state controlled by militias.Who would have thought community organizing would be such relevant experience for a President? Obama is now bombing in Iraq the same ISIS terrorists he just wanted to help in Syria?